Honestly, I don’t understand how it could work, but it does! It really does! The process is fairly similar to the “traditional” fragging process with cutting a polyp and gluing it to a plug or piece of rubble, but where this approach differs is where you cut the polyp. Rather than cutting under the base of the polyp trying to preserve as much of the tissue as you can, in this method you cut off the head of the polyp but leave the stalk behind. Sounds, like instant dead polyp, right? This Darth Maul paly is starting to grow outside of where I want it to be and it is annoying the frag above it. You can see it has a pretty long stalk which makes this one a great example for our story here. The cut you make is shown with the red line. 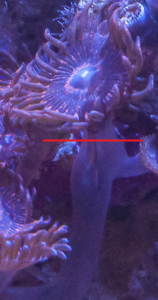 If you look closely at the polyp’s stalk there is a clear point where the head of the polyp ends and the stalk begins. This is where you cut. It is best to do this outside of your tank if you can. This was encrusted to my rock work, so I did it in the tank. I used a brand new straight-edge razor blade and cut through in one slice. You should be left with the polyp head and the now (very) annoyed polyp stalk. 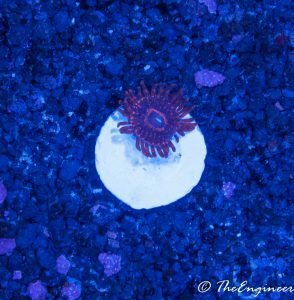 Some people simply put the polyp head on some rubble in a low flow area and wait for it to attach by itself. I don’t trust that to happen before it blows away or gets bowled over by a snail, so I glue it down. It just takes a small dab of super glue gel on a frag plug or piece of rock rubble. (I personally prefer rubble for things that will stay in my tank. I plan to trade this new frag to someone though, so I went with the plug.) Gently place the cut side of the polyp into the glue and quickly put it back in the water. Super glue creates heat while it dries and it can injure your already very annoyed polyp. Some people like to drop new frags into a cup of tank water with a few drops of iodine in it. The idea is that it prevents infection on the area you cut. It seems like a good idea to me to do that, I just didn’t in this case cause I was lazy. Less than 24 hours later and it is open! If everything went according to plan, you now have yourself a freshly fragged polyp. This picture to the left was taken less than 24 hours after cutting. It doesn’t even seem to act like anything has changed at all. Keep the new frag in an area of low flow for a few days (at least) so new growth can quickly form to hold on to the plug naturally. 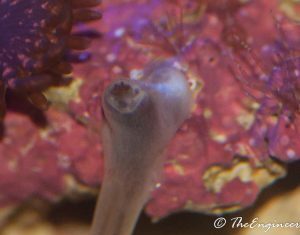 If you read the whole post, you might be asking yourself how this creates two polyps from one. That’s the other half of this magic act. The stalk that you left behind will regrow a new polyp! It will take about a month for the new polyp to fully form, but you wind up with two polyps where there once was only one. 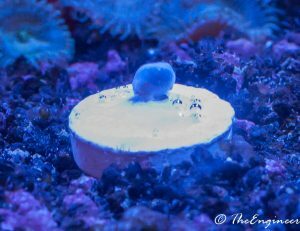 I’ll take some pictures of mine once the polyp starts to grow. As of this writing, it has been 7 days since I made the frag and the growth hasn’t started yet. The cut stalk has a new polyp forming! It has only been ten days since I cut the polyp head off and the new polyp is already taking shape! There even appears to be some new mat growth in the same direction as the original polyp was heading. Looks like I might have to make the same cut again in the not too distant future. Next PostNext How much flow can my plumbing handle?